What problems are you likely to come across with the ceilings of a Georgian, Victorian or Edwardian period house? Typically you will find textured papers and Artex coatings to be removed, loose or cracked plaster, areas of missing plaster, stains and mould, and decorative cornices obscured with paint. A common problem faced by the period house owner is inappropriate coverings or treatments of ceilings. For example, ceilings can be covered with Artex or other textured plasters, or textured and woodchip papers. If you remove these coatings, be prepared to have to replace the whole ceiling as the removal process may weaken the ceiling or reveal major flaws. Beware that some Artex contains asbestos. In most old houses, ceiling plaster has lost some or all of its 'key' to the laths and the careless DIY-er can cause complete failure. 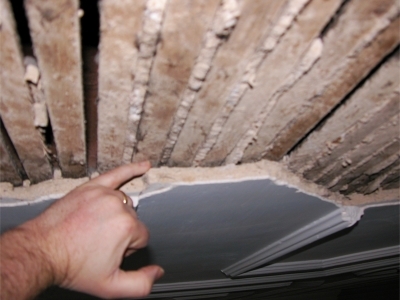 It is the part between the laths which is the weakest link; once broken, these 'ears' no longer hold the plaster up and if enough areas break, then the ceiling will fall. Hairline cracks should not be of concern but larger cracks or any with a 'step' indicating failure should be monitored or repair seriously contemplated. This ceiling has failed; one area has fallen and the gap between plaster and laths shows that more of the ceiling may fall. Where flawed plaster has been mishandled, it can fall off the ceiling. 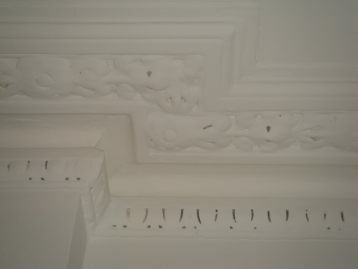 Small areas of missing plaster mouldings can be reconstructed. Areas of flat plaster are best patched although it is difficult to achieve a perfect surface. Larger areas are best replaced completely. Every time plaster embellishments such as cornices and centre roses are repainted, the detail in the plasterwork becomes more and more obscured. It is an easy but satisfying process to remove the paint. Follow the advice on the restoration page to strip this paint.